Home Entertainment Nintendo Reveals Mario Maker 2, Link’s Awakening Remake and More! Nintendo Reveals Mario Maker 2, Link’s Awakening Remake and More! In addition to introducing other acclaimed titles coming to Nintendo Switch, like Hellblade: Senua’s Sacrifice and Bloodstained: Ritual of the Night, the video also provided more details about upcoming Nintendo games like Fire Emblem: Three Houses, Yoshi’s Crafted World, Daemon X Machine, and Marvel Ultimate Alliance 3: The Black Order, among many others. Nintendo Switch will also be home to BOXBOY! + BOXGIRL!, the next iteration in the charming puzzle-platformer series coming to Nintendo eShop. Plus, starting today, Nintendo Switch owners will have access to surprise launches like the online 99-player puzzle-fest Tetris 99 and classic Square Enix role-playing game Final Fantasy IX, as well as new co-op DLC for Captain Toad: Treasure Tracker and free demos for upcoming anticipated games. Super Mario Maker 2: In this new game, players can create the Super Mario courses of their dreams, with access to even more tools, items, and features. Super Mario Maker 2 launches exclusively for Nintendo Switch this June. The Legend of Zelda: Link’s Awakening: Originally released for the Game Boy system more than 25 years ago, one of the most beloved games in the Legend of Zelda series returns. In this modern re-imagining, players travel to the mysterious island of Koholint to guide Link on a perilous adventure. 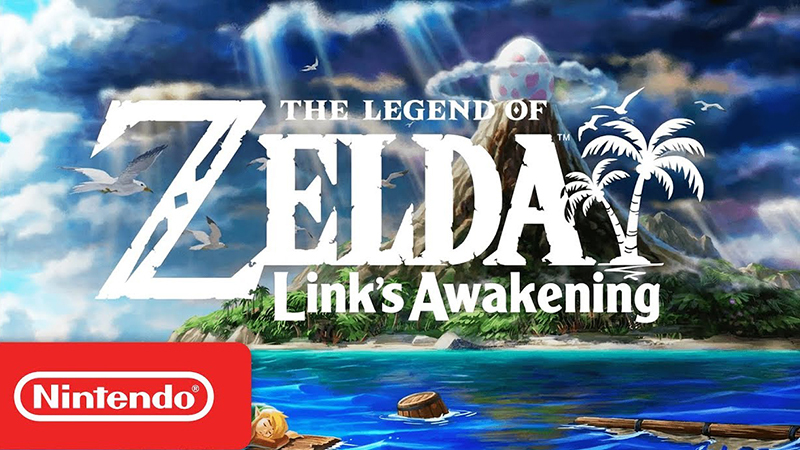 The Legend of Zelda: Link’s Awakening arrives exclusively on Nintendo Switch in 2019. ASTRAL CHAIN: ASTRAL CHAIN is a new action game from PlatinumGames, directed by Takahisa Taura, known for his work as the game designer on NieR:Automata, and supervised by Hideki Kamiya, creator of the Bayonetta series. As part of a police special forces unit in a multicultural futuristic city, players work together with a special living weapon, the Legion, in a synergetic action system of battle and exploration. More details about this Nintendo Switch exclusive will be revealed in the future. ASTRAL CHAIN launches exclusively for Nintendo Switch on Aug. 30. Fire Emblem: Three Houses: The Black Eagles. The Blue Lions. The Golden Deer. Three noble houses that are part of the Officer’s Academy, an elite facility that trains students in the ways of weapons, magic and special skills. As a professor, the player must choose one of these houses to lead its students in grid-based battles with life-or-death stakes. Each house is comprised of many different students to meet and train, each with her or his own personality and skills. These students can interact with each other at the academy, strengthening their bonds and supporting each other on the battlefield. The Fire Emblem: Three Houses standalone game and the Fire Emblem: Three Houses — Seasons of Warfare Edition both launch exclusively for Nintendo Switch on July 26. BOXBOY! + BOXGIRL! : Welcome back, BOXBOY! The fan-favorite puzzle series is back for the first time on Nintendo Switch with a brand-new game! In addition to 270 new levels, two players can work as a team to solve puzzles in a new co-op mode. As a bonus, players who complete the game can access a new adventure starring Qudy. BOXBOY! + BOXGIRL! unboxes itself on Nintendo eShop on April 26. Tetris 99: The iconic puzzle game Tetris arrives, but with an online experience like no other. In this next entry in the storied puzzle franchise, 99 players compete together until only one is left standing. Nintendo Switch Online members (membership sold separately) can battle for dominance in this free-to-download software. The Nintendo Switch exclusive will be available to download starting today, and players can look forward to battling it out in upcoming online events. Bloodstained: Ritual of the Night: The side-scrolling action of yore rises once again in Bloodstained: Ritual of the Night. Play as Miriam, host of the Alchemist’s Curse, as she steals the abilities of enemies, bends gravity to her will and darts around the game’s elaborate castle at lightning speed. Here, the laws of reality — and 2D side-scrollers — don’t apply. Bloodstained: Ritual of the Night emerges from the shadows this summer for Nintendo Switch. Yoshi’s Crafted World: Before Yoshi’s Crafted World launches on March 29, Nintendo Switch owners can head to Nintendo eShop to download a free demo for the artfully handcrafted game starting today! In the Yoshi’s Crafted World game, players can explore the Front and Flip-Side of stages while rafting, racing solar cars, tearing through the sky on a plane and experiencing many other wild and surprising gameplay sequences. Using coins collected through the varied and secret-filled levels, players can unlock 180 different crafted costumes that Yoshi can wear. Captain Toad: Treasure Tracker Update and Special Episode DLC: Guess who is still ready for adventure? After downloading a free Nintendo Switch version update for the Captain Toad: Treasure Tracker game that is available starting today, all courses in the game will support a new two-player co-op mode featuring a second Toad to explore simultaneously with a friend. And on March 14, new paid DLC arrives that adds 18 new challenges to the game, including five new courses and new Shiny Crowns, which can be obtained in each course. New players can get the Captain Toad: Treasure Tracker game together with the updates and all the new Special Episode content in a digital bundle available for purchase on Nintendo eShop beginning Feb. 13. Players who purchase the bundle or the Captain Toad: Treasure Tracker – Special Episode DLC will receive early access to one of the courses in Captain Toad: Treasure Tracker – Special Episode, with the remainder of the courses launching on March 14. Super Smash Bros. Ultimate Update: The fastest-selling console-exclusive game in Nintendo history is about to spring forward with a free Ver. 3.0 update coming to the game this spring. Before the end of April, Joker from Persona 5 will be available as a playable fighter. Announced in December, Joker is the first Fighters Pass DLC fighter to join the game’s expansive cast. Players who want to get access to five upcoming DLC fighters plus additional stages and music can purchase the Super Smash Bros. Ultimate Fighters Pass by visiting https://smashbros.nintendo.com/buy/dlc/. Additional details about the 3.0 update and upcoming Fighters Pass content will be revealed in the future. Also, be on the lookout for new amiibo in 2019 like Snake, Simon, Squirtle, Pokémon Trainer, and Ivysaur. DRAGON QUEST BUILDERS 2: Combining both RPG and crafting gameplay together, players gather materials to create things like weapons, buildings, and even entire towns. With the help of the mysterious Malroth and other villagers, players will explore large islands, find quests and battle monsters and bosses scattered around the world. Those who own the original DRAGON QUEST BUILDERS on their Nintendo Switch system can craft the Legendary Builder’s outfit and the Dragonlord’s Throne. DRAGON QUEST BUILDERS 2 launches for Nintendo Switch on July 12. New Star Fox Missions in Starlink: Battle for Atlas: The Starlink: Battle for Atlas digital update coming in April will add new Star Fox missions to the Nintendo Switch version of the game. Play as Peppy, Falco, and Slippy to help aid the fight to down Star Wolf’s lieutenants, Andrew, Pigma, and Leon, in a series of challenging missions. Additional content released as part of the update includes new starship races, faction missions and more. The spring update of Starlink: Battle for Atlas launches this April on Nintendo Switch.